A nutrition-focused report that outlines your response to 10 important nutrients. Is the Nutrition Profile right for me? Identify your risks and savour life. Why do you need a Nutrition Profile? If what you eat does not meet your unique needs, a supposedly healthy diet can actually put you at risk of developing chronic diseases. Don’t trust to luck if you want to live a long and healthy life! 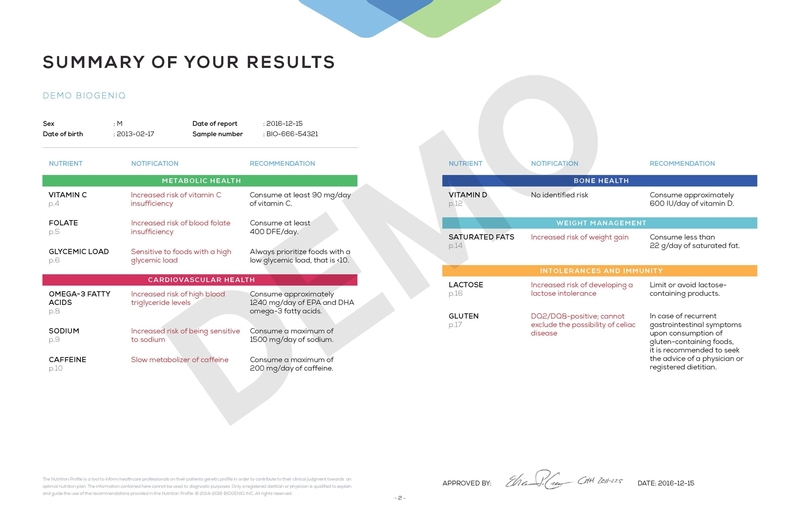 Take a Nutrition Profile test and learn about the crucial link between DNA and diet. Dietary advice tailored to your DNA. 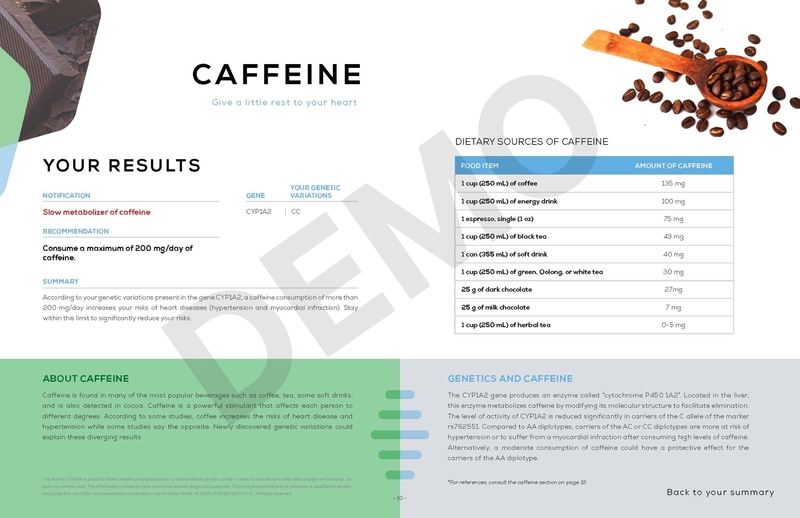 Your Nutrition Profile report will contain straightforward recommendations based on your unique needs. In addition, a healthcare professional will assist you in applying the recommendations to your diet. 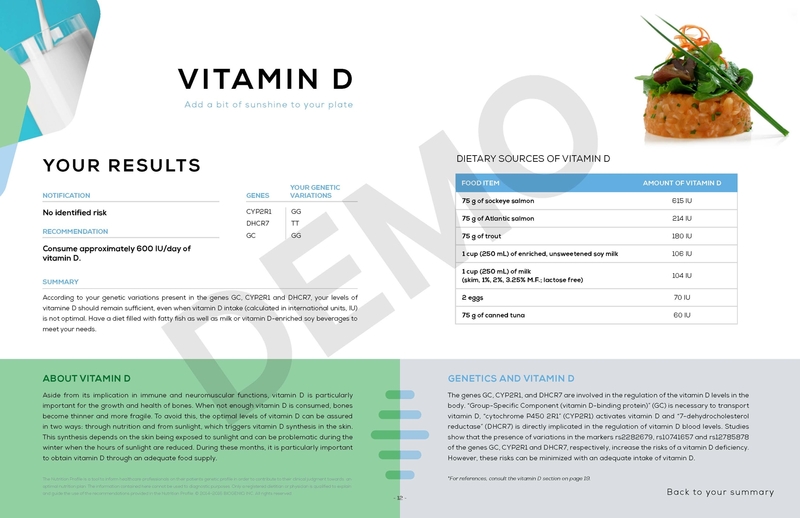 The clickable images below are sample pages from the Nutrition Profile. The full report is over twenty pages long and contains personalized recommendations and advice. – Jennifer, 31 years old, Nutrition Profile : She’s sensitive to sodium. – Christina, 48 years old, Nutrition Profile : She’s sensitive to saturated fats and foods with a high glycemic load. Why have your DNA tested by BiogeniQ? By learning about the crucial link between your DNA and your diet, you will be able to adapt your dietary habits to meet your unique needs. Our specialists will help you understand the results of your genetic test and apply the recommendations to your diet. BiogeniQ specializes in giving actionable and specific recommendations based on genetic information in an ethical and secure way.